For a long time, the Ford Expedition was forgotten—perhaps, even forgettable. Last redesigned in 2007, the SUV received next-to-no attention until 2015, when Dearborn deigned to drop a 3.5-liter Ecoboost under the hood as part of the mildest of refreshes. It was fine, the “C’s get degrees” approach compared to General Motors valedictorian lineup of full-size, three-row SUVs. But like the college student that realized “C’s get degrees” isn’t a viable career strategy, the 2018 Ford Expedition has arrived. This is, by no small margin, the most competitive SUV from Dearborn recently, a monster of a vehicle loaded with power, capability, technology, and versatility. It’s the vehicle Ford should have introduced in 2015—it’s a vehicle that should frighten General Motors. It’s also an evolution of one of Ford’s most successful products, the 2018 F-150, borrowing that truck’s revised powertrain and aluminum-intensive construction, but also pairing it with the SUV traits that’s kept the Explorer in family driveways for decades. A 3.5-liter, twin-turbocharged V-6 works alongside a 10-speed automatic that was developed with GM to motivate the big three-rower. Packing up to 400 horsepower and 480 pound-feet of torque in Platinum trim or 375 hp and 470 lb-ft in XL, XLT, and Limited trims, the Expedition is powered roughly the same as the F-150—the difference in output between the truck and SUV is negligible, unless you’re talking about the F-150 Raptor. The Ecoboost is a fantastic engine in this application, and the 10-speed automatic keeps to itself unless you really hammer on the pedal, much like the F-150 I tested earlier this year. Like the truck, most throttle inputs elicit a delightful whistling from under the hood as the 3.5-liter’s twin turbochargers spool up. That noise is followed by a surge of power that should allow the Expedition to easily pass, even shuttling an entire soccer team in the expansive second and third rows. Like the Explorer, the Expedition gets an off-road-focused Terrain Management System on the FX4 trim, but we can’t yet report on that model. Look for a more expansive report on this particular performance aspect at The Car Connection. While the Expedition has had a 3.5-liter Ecoboost since its last refresh, it felt more like a proof of concept. Adding more power and attaching a cutting-edge automatic transmission makes this iteration feel like the finished product, a powertrain in a full-size, three-row SUV that feels as innovative, interesting, and capable as the first F-150 Ecoboost was so many years ago. SUVs like the Expedition might feel like dinosaurs, but compared to the V-8-powered monsters from General Motors, Toyota, and Nissan, this Ford is a much more evolved take on the breed. And that fact shows in the stats. Not only is the Expedition the most fuel-efficient vehicle in its class, but it’s also the most capable when it comes to towing. 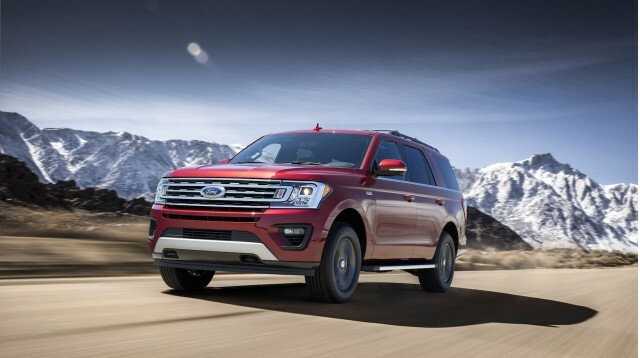 Ford claims more than half its Expedition customers drag something regularly, and meeting that need is a best-in-class tow rating of 9,300 pounds, a figure on par with some large pickup trucks.